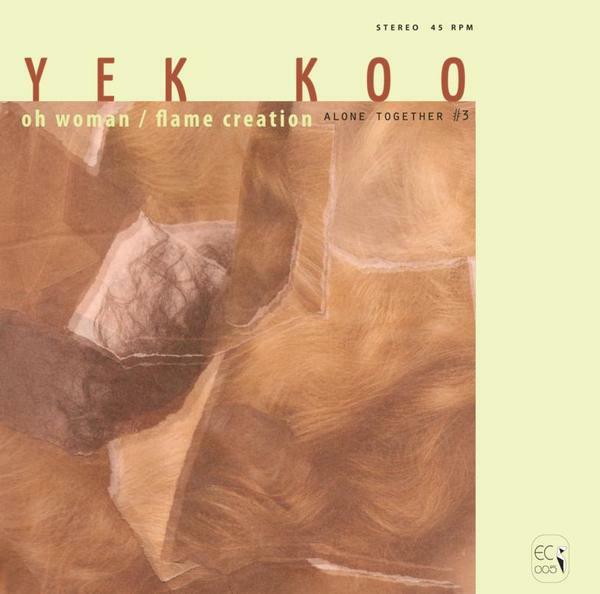 Helga Fassonaki (of Metal Rouge) returns as yek koo with her first new release since last years ‘I Saw Myself’ on Stunned Records. Gone are the horizontal string-sprawl epics of past, replaced by a new density and compositional focus. Dictaphone guitar-swirl and declamatory vocal preaching atop loping nod-out rhythm samples, you could almost say yek koo has gone pop….until the b-side hits: a sheet of live industrial slamming recorded at LA’s now defunct spiritual hub, the Echo Curio, that sounds like a real-time channeling of Kali. As hard to pin down as ever, the closest point of comparison would be the Morley/Russell spit 7” lathe on Corpus Hermeticum left to percolate in the merciless Californian sun And even that sounds nothing like it. Confusing, enticing, nuanced and brutal.